Are all your staff confident in communicating with Deaf patients? Do reception staff know how to book a BSL interpreter? Can appointments be made other than by in person / by telephone? Under ‘The Accessibility Standard’, there are regulations which must be complied with by all commissioners and providers of NHS funded care in order to make healthcare accessible to Deaf British Sign Language (BSL) users. In a thought provoking, interactive session we will explain the difficulties and problems that a Deaf patient would have when going to the doctor, dentist, hospital etc. Having knowledge of the potential pitfalls helps to prevent them from arising. We would run through what your duties and obligations are under the law (The Equality Act 2010, and The Accessibility Standard), so all members of staff are aware of the importance of treating Deaf patients with respect and fairness. Importantly we will discuss practical steps every employee can take to make healthcare accessible. This would be followed by some basic BSL learning pertinent to your needs. Normally meeting and greeting and making appointments. 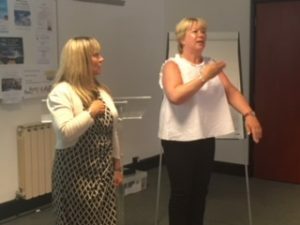 Educational and motivating, our training sessions don’t only enable you to comply with current legislation; they are a great way to find out about issues that affect Deaf patients, friends, family members and work colleagues, and improve your communication skills. We are running several Deaf Awareness and BSL training sessions with GPs reception staff and nurses in the Camberley area.